Geimund, a Nord citizen, is the proprietor of Solitude Stables, where he lives with his wife Fridrika and son Horm, and sells horses. He used to be a mercenary, but retired after a nasty encounter with hagravens at Ravenscar Hollow. He spends most of his time outside the stables, either tending to the horses or working the crops, from when he wakes up at 8am until he heads back inside the stable building at 8pm. The evenings are spent with his family until he goes to bed at midnight. He wears a set of farmer's clothes with boots. He carries an iron mace, a spare belted tunic, and an assortment of lower-class items and gold. When you get near him, he will immediately ask: "You got business at the stables?" When you talk to him he will reveal himself to be quite happy in life, saying: "Work hard for the future and leave the past be. That's my motto." or "With a wife like Fridrika and a son like Horm, I'm the luckiest man in Skyrim." However, if Fridrika and Horm are dead, things will be different: "You wouldn't know it, but before my family got killed? I was the luckiest man in Skyrim." When exiting conversation, he will say: "If you're heading up to Solitude you should stop to check out the view on your way. It's a good one." and "Carriages to all the cities in Skyrim. Don't forget us." In addition to selling horses, you can ask him how long he's been a trader: "Been about eight years now. I used to be a mercenary, but one trip to Ravenscar Hollow cured me of that. There's hagravens in that cave with talons like daggers. They'll open your bowels quick as a wink if you let 'em get close. Creature like that'll make a man think long and hard about what he wants out of life." If Geimund dies, his son Horm inherits the stables and sells its horses. 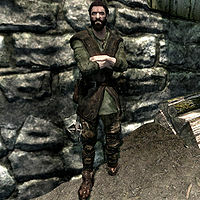 There is also a Nord man in Oblivion with the name Geimund.